Graduating in 2001 from Life University, Dr. Dan worked in Nashville for a few years before returning to the West Knoxville area to practice back home near his family. 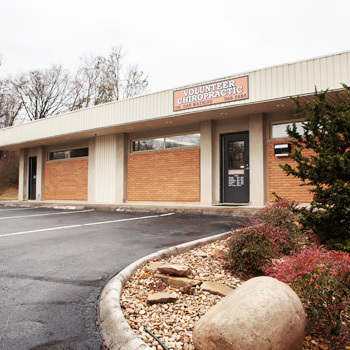 Named after the Tennessee Volunteers, Volunteer Chiropractic opened its doors in 2005 to our local community and those who visit us from Farragut. We welcome families and patients of all ages and health conditions to visit us for care. From newborns to 90-plus-year-olds, individuals of all stages of life can benefit from safe and natural chiropractic. We also help athletes with sports injuries. Because we believe in offering a whole body approach to better health, we are one of the few practices in the area that provides chiropractic, acupuncture and massage therapy under one roof. Chiropractic care: Dr. Dan keeps up to date on the latest techniques through continuing education classes, so you get the most comprehensive care possible. Acupuncture: Through trigger point therapy and acupuncture, patients like you heal faster and stay well longer. Massage therapy: Our team of massage therapists is here to help enhance your healing in a relaxed environment. If you’ve ever felt like a number at a health care practitioner’s office in the past, you won’t feel that way at our practice. Caring and personable, Dr. Dan will take the time to listen to your needs and offer customized solutions to help you recover your health. Dr. Dan loves seeing people feel better, get better and live better. Many patients visit us thinking they have to take medications for the rest of their lives, which isn’t necessarily true. Chiropractic care helps you heal from the inside out, naturally. If you’d like to return to doing the things in life you love, contact our chiropractic care center today!